hardpass is an open source hardware password manager. Its motto is "Never roll your own crypto" - use gpg instead! The project is documented on hackaday.io, GitHub and iSticktoIt.net. Note: Documentation on the software is not yet finished. Licensed as GNU GPLv3 and CC-by-sa 4.0intl. A big part in the development of hardpass was the focus on not just a completely Libre end product, but also make the toochain as Open as possible. The circuit board was developed with KiCad, some 3d models were made in FreeCAD, and the software for this project thing can be built on a Linux / GNU/Linux distribution with the GNU GCC compiler. As a logical consequence, I have licensed the parts of hardpass that I own (i.e. excluding libraries, some footprints and 3d models, etc.) under the GNU General Public License, Version 3, with some minor parts under the Creative Commons Attribution & Share Alike 4.0 International. This allows anyone to recreate this project, and is an encouragement to to contribute you improvements back to the community. 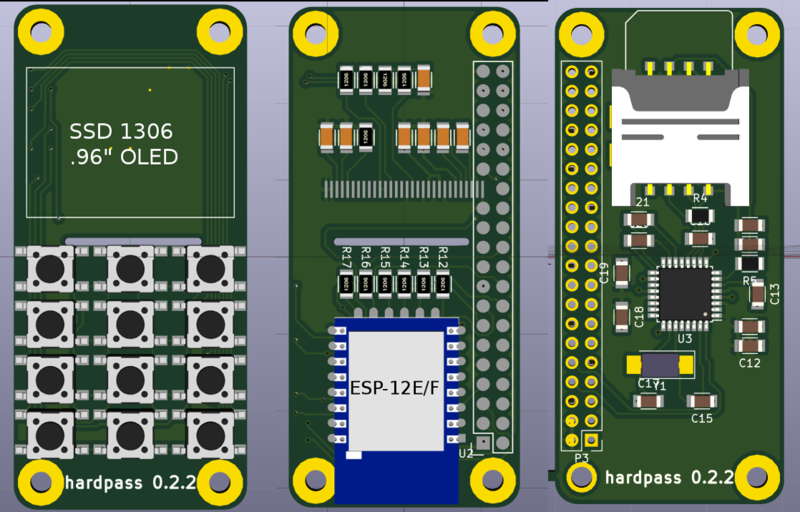 Version 0.1, the initial prototype, used only easily obtainable modules (ESP-03, SSD1306 OLED module, 6mm tact. buttons), mounted on the front and back of the Raspberry Pi Zero. It is (for the exception of the smart card interface) 100% compatible; so if you don't want to solder small components and/or get a PCB manufactured, this is still an option. Since Version 0.2 a PCB has been designed, which houses the display, PIN pad and WiFi module. A secondary PCB is currently in the design phase which will hold a TDA8029 Smart Card interface and SIM card tray. Version 0.2.0 was attempting to use the 20 pin variety of the SSD1306, but had to be abandoned due to availability and solderability issues. Version 0.2.1 was the first built prototype, replacing the OLED circuitry with header pins for a preassembled module to speed up development. The current version, 0.2.2, made the switch to the 30 pin screen, and with the same version number, hardpass-SCI was introduced. The device is supposed to be as modular as possible, so parts of the software (e.g. User Interface) or hardware (e.g. swap ESP8266 for a Pi Zero W). You don't need a lot of tools to build you own hardpass. A soldering iron with a fine and a flat tip, a pair of tweezers, some tape and a steady hand should suffice. Below is the Bill Of Materials, which you should obtain fully before continuing. Most of the parts can be obtained from AliExpress rather cheaply. Some parts (see footnotes) have to be ordered from some where else. The APX803 and its resistor can be replaced by an RC circuit. **TODO**: find suitable values for RC-reset! The PCB (files available from GitHub) can be ordered through any of the common PCB manufacturers. For some, you need to export the .kicad_pcb into Gerber files; this can be done with the plot function in pcbnew. Due to the limited space on the board, order of operations is critical. Start with the screen: to get it through the narrow slot in the middle of the PCB, you might have to trim the flat flex cable slightly. Be careful not cut any traces! Use double sided tape on the back of the OLED to tack it onto the front. While doing so, align the holes of the flat flex with the pads on the back of the PCB. Tape the flat flex in place temporarily, and solder it onto the board. My technique was to put some solder on the flat tip of my iron, and carefully push it onto the flex. Remove pins 25 and 27 from the header. Check if the header stands up straight (as opposed to slanted) and optionally push one row into alignment. Place the header pin onto its pads, and tack it down in one corner. Carefully align it, then solder the other corner. Check alignment one last time and solder the other pads. You can push down the plastic spacer, so the Pi can get closer to the hardpass PCB. Align and solder the ESP-12E/-12F module. A conical tip might be helpful to solder the side nearest to the header. Finally, turn the board over, prop it up and solder the tact switches. Now is a good time to test the PCB with a Pi with a female header installed. Refer to the software setup guide on how to install the components hardpass is made of. You won't be able to (easily) part the Pi from hardpass if you continue here! Push the header through the holes on the Pi. If you have moved the plastic spacer (step 7), you might have to persuade some of the pins a little. Solder Pi and hardpass together. This is where you could be finished - unless you want Smart Card support. The order of operations on this board isn't important, just be careful to align the IC correctly. Refer to the Schematic, PCB CAD file and 3d Viewer if you are unsure. There should be enough space left on the header pins to shove the hardpass-SCI PCB on. You can trim flush the header pins before soldering. Congratulations, hardware work is done! hardpass runs on the latest Raspbian image from RaspberryPi.org. The Raspberry Pi Foundsation's Installation Guide is very helpful. You now should be able to try and connect your Pi to you WiFi through the ESP. Finally, change the password of the pi user! hardpass relies on pass for its password management. Instructions on installing and configuring pass can be found at the project homepage linked above. If you decided you want to use a smart card, now is the time to generate (or import) keys on the smart card. Afterwards, refer to pass' documentation again on how to import preexisting passwords using an import script. Now it is time to switch over from using the command line to using the screen and buttons on the device. Use sudo systemctl enable hardpass.service to enable hardpass' user interface and reboot. If you have a look at you host computer's dmesg -w output, you should see hardpass identify itself as a Composite USB device; afterwards, an entry in lsusb should also have appeared. Note that for libcomposite, no Windows driver is available. Refer to the documentation on how to swap drivers **TODO**. You can select an entry with  (lower center). If a digit is displayed at the beginning of an entry, press it on the number pad to jump to that entry. In the password selection screen, you can jump to the first entry starting with a letter by pressing the corresponding key, using the dumb phone style T9 method. jumps to entries beginning with a number,  to those starting with an A,  to D, and so on, up to  to W.
When asked to enter your passphrase,  to  act as expected, [#] is OK and [*] is cancel.